38 Comments This post may contain affiliate links. 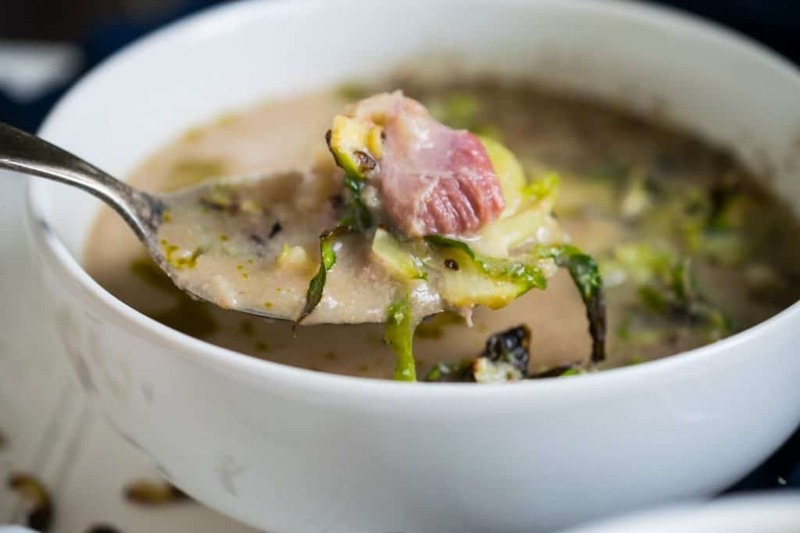 You are going to love this low carb paleo, keto Creamy Ham Soup. Bursting with flavor, comforting and best of all, easy to make. It’s the perfect soup for this time of year! Great for your holiday spread or even for breakfast… but made without beans! 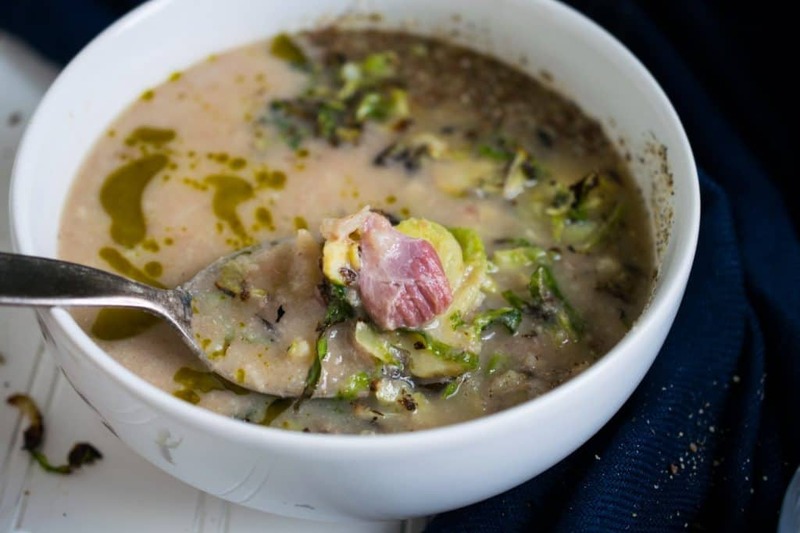 I grew up on potajes, these heavy duty legume soups loaded with ham and other meats. Usually a tomato base and a few other things, among the beans that I no longer consume. When I saw this ham hock at Whole Foods, I grabbed it. In that moment I could taste the smoky saltiness that I brought to those soups of my child hood. Yes! 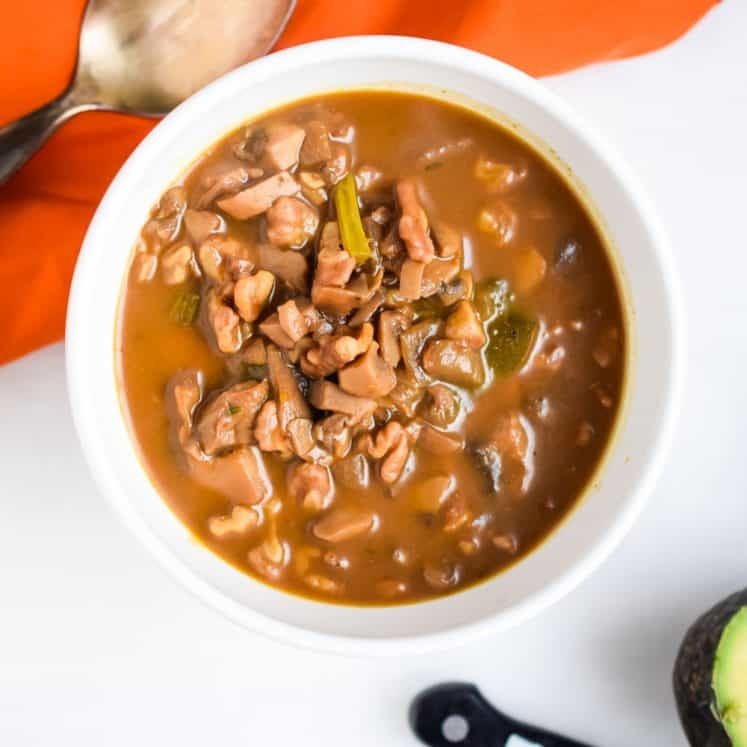 This recipe can be made in the pressure cooker in just 50 minutes or you can use your slow cooker and cook it on high for 4-6 hours! Either way, it’s minimal hands-on time. 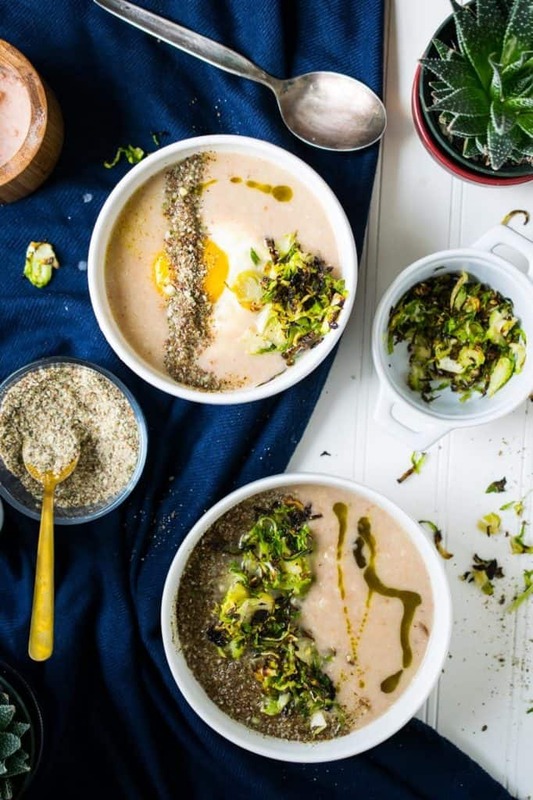 The soup alone without the toppings is only 5 ingredients. 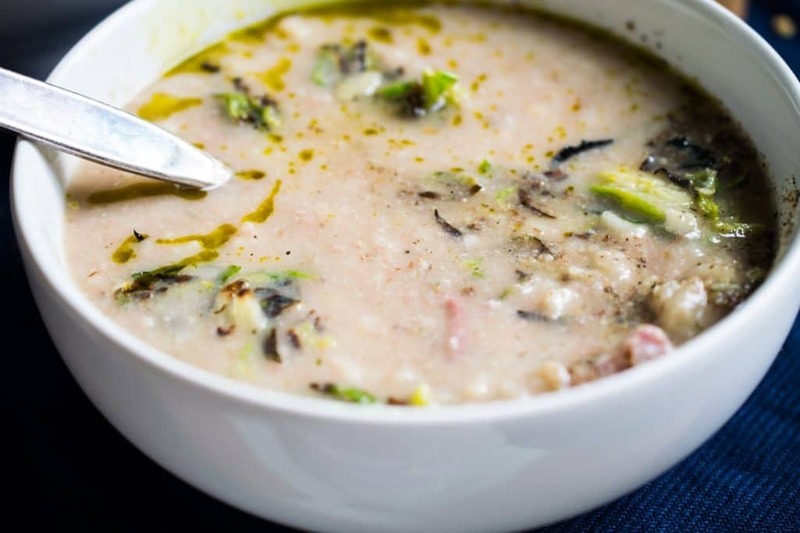 Cauliflower, bone broth, ham hock, bay leaves, and nutmeg. That’s it. I used a Wilshire Farms Smoked Ham Hock. It’s nightshade free. I got it at Whole Foods. I highly suggest the topping though because YUM + FUN. Grind together ¼ cup pepitas and ¼ cup flax seeds. Mix with 1 teaspoon salt, 1 teaspoon black pepper and 1 teaspoon garlic powder. Sprinkle on all things! The crispy Brussel sprouts take 8 minutes to make. Just grab a bag of shredded Brussel sprouts and spread them out on a sheet pan. 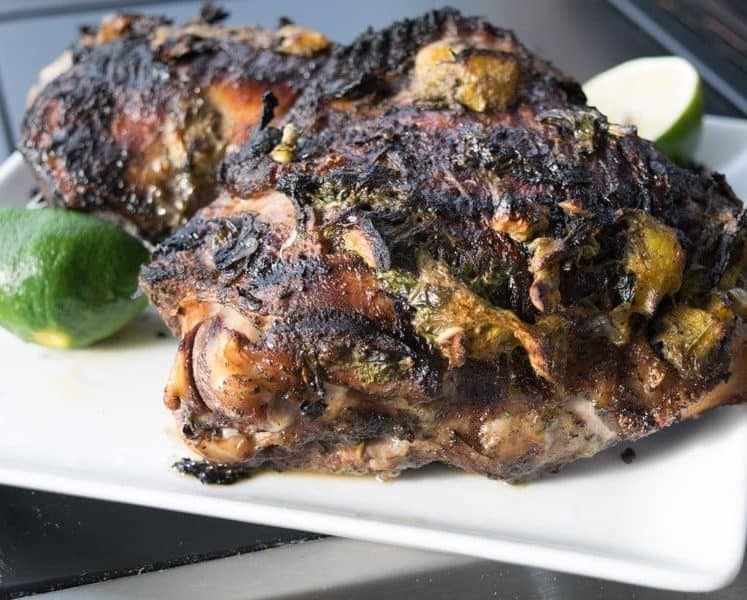 Spray with avocado or coconut oil and broil for 6-8 minutes until toasty. Das it. Fried egg, a scoop of ground beef, avocado slices, olive oil, AVOCADO OIL. The possibilities are endless! 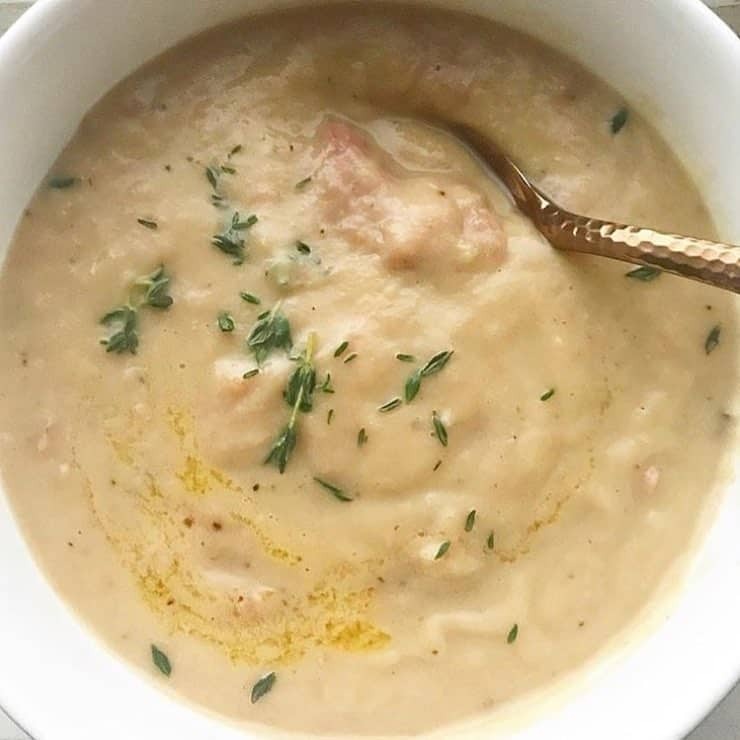 Garnish and top this creamy ham soup with whateyour you heart desires, or leave it plain While not the prettiest soup, it sure is tasty! 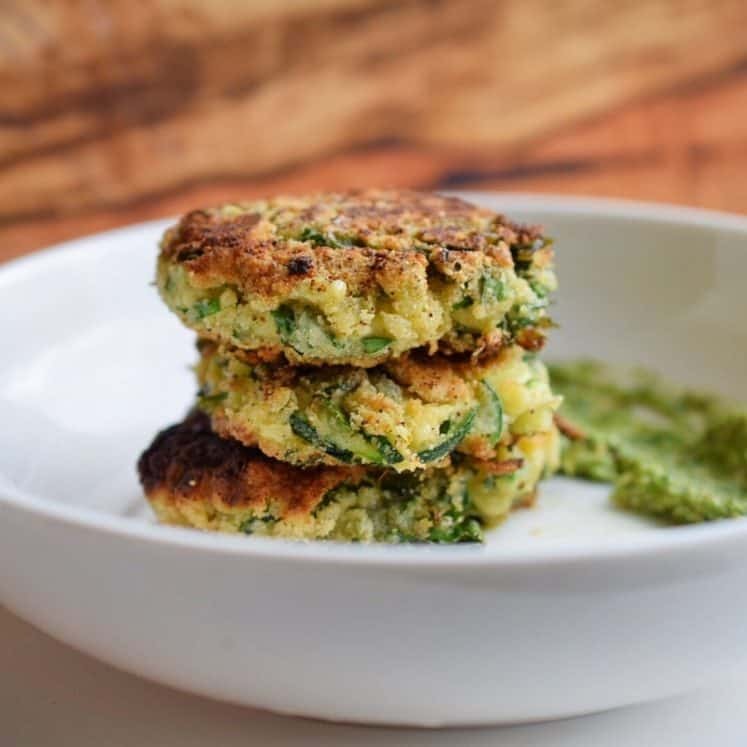 Delicious and easy comfort food that is truly made healthy! Cut the cauliflower into 4-5 pieces. 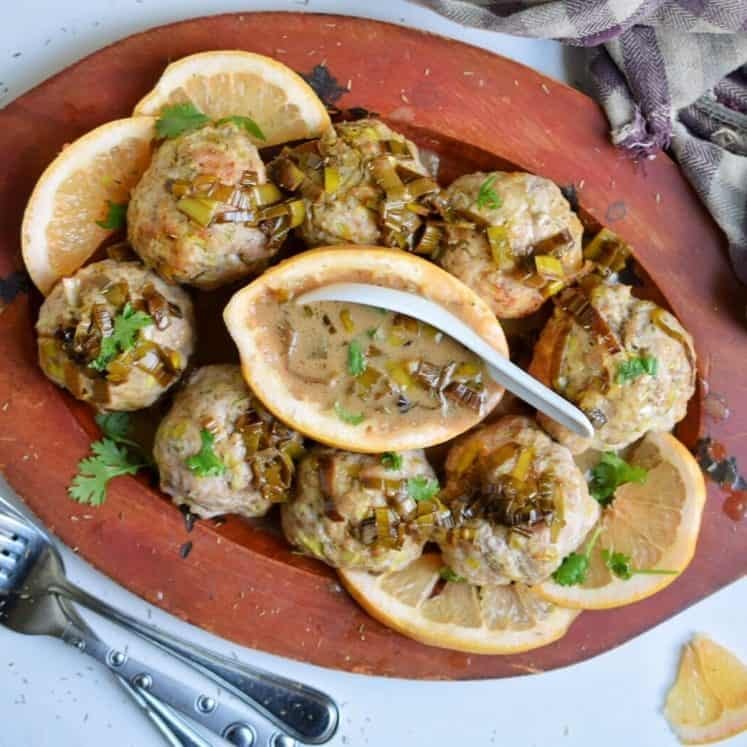 Place them in your slow cooker or pressure cooker. Add in the ham hock, bay leaves, nutmeg and broth. If the ham and/or cauliflower are protruding a lot from the broth, add in water until they are just submerged. For Pressure Cooker: Set to HIGH FOR 50 MINUTES. For Slow Cooker: Set to HIGH FOR 4 HOURS. When it is done, the cauliflower should be tender and mostly falling apart. Use tongs and/or a slotted spoon to fish out the ham hock. It will be falling apart too. Set it in a small bowl and shred it. Remove the bone and any large pieces of fat. Transfer most of the liquid along with most of the cauliflower, aim for the bigger pieces, to your blender. Add in a few pieces of ham. Blend until almost smooth. It should be a beige color, with pearl sized cauliflower pieces and specks of pink. Pour this mix back in to the slow cooker or pressure cooker, add in the shredded ham. Mix well. It should be creamy with chunks of cauliflower about the size of beans (you see!) and pieces of ham. 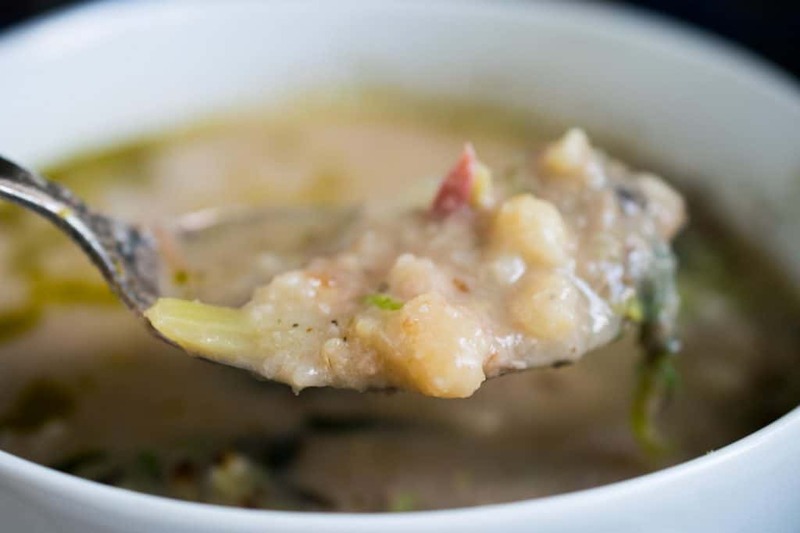 If you want the soup thicker or thinner you can add more broth or water, alternatively you can reduce it (bring it to a simmer until desired consistency is achieved). Serve and salt to taste. As I mentioned above, the ham is pretty salty, asis the seedy seasoning. 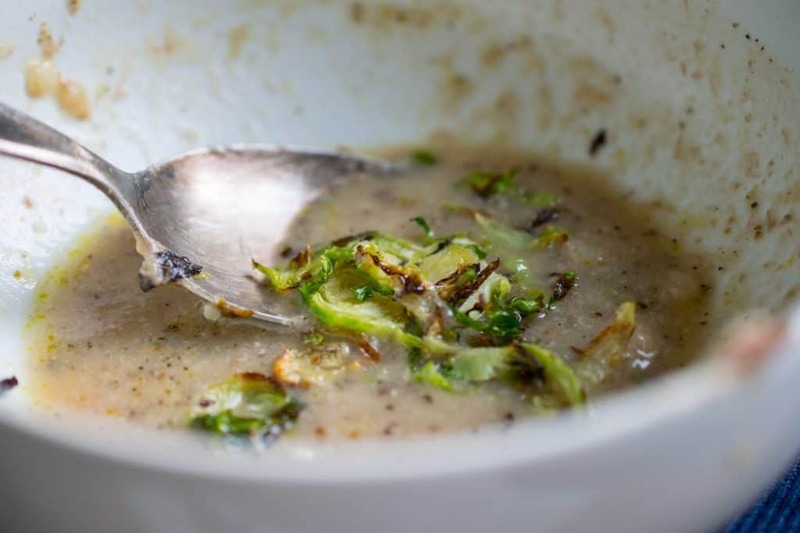 Add your toppings and salt as needed when you serve the soup. Beef or chicken bone broth? Can you use a frozen ham bone in the instant pot? Or should it be thawed first? Yet another favorite! 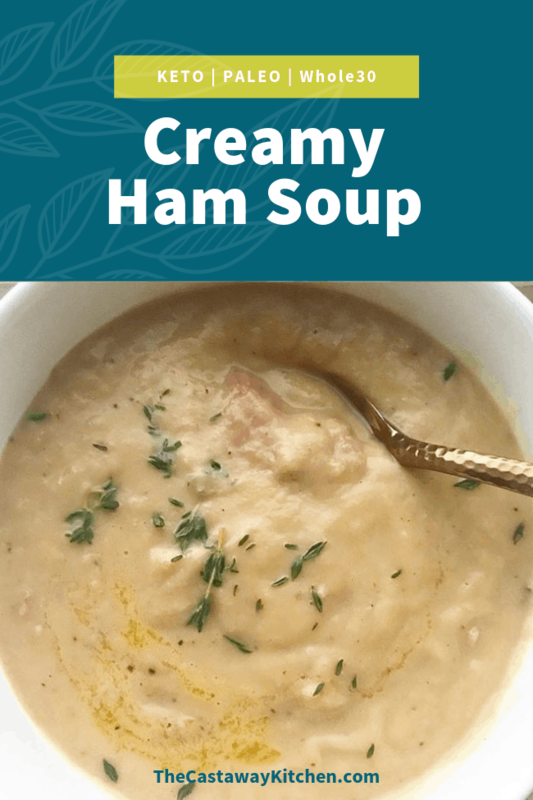 I love ham but was never a bean and ham soup fan. All changed!!! My house smelled so yummy on a snowy day and that first bowl…oh my word! You, girlfriend, are a genius! yeayyy thank you so much! Thanks for commenting!